THIS REVISED AND COMPLETELY UPDATED BOOK is a practical, step-by-step guide to preparing a business plan you can use to raise financing. It shows you how to address the concerns of investors or lenders. A good plan will not guarantee financing, however, it is an essential first step in the search. Without it, you will not stand a chance! A new chapter has been added on creating your business model and value proposition. This edition also shows you the importance of social media in growing your business. It recommends that you create your own website and use it in conjunction with your plan to attract potential lenders or investors. It also suggests using photos and short videos to augment your written plan. It covers points you will need to consider before starting your plan. It includes chapters on strategic planning and the importance of using spreadsheets in your planning process. The chapter on preparing your human resource plan covers government regulations relating to employees. It also looks at the effectiveness of employee ownership plans. A chapter has been added on using professional advisors and how to keep costs down. There are chapters to help you manage your time and projects. Learn how to prepare your advertising, marketing and Internet strategies. This book covers premises and the advantages of being home-based. It looks at the merits of equipment leasing as a method of off-balance sheet financing. This book also includes a sample plan to help you see how your plan should be structured. When you have finished your plan, you will get tips on how to print it and prepare a PDF version that you can send as an email attachment. Learn about some presentation software packages that could help you. You’ll find a chapter on how to speak in public to groups of potential investors. Finally, read reviews on software packages that you can use to prepare your own plan from scratch. Author, Iain Williamson, is an entrepreneur, business consultant and seminar leader. His views have appeared in many newspaper articles. He has also been the guest speaker on a CBC Radio phone-in show on starting a business in a recession. In addition, he has appeared on television shows such as: CBC TV’s Venture; TVO’s MoneysWorth, and Canada Tonight of BCTV and CHCH Television. Iain spent five years as a financial analyst and knows what makes business tick. For fourteen years he operated his own businesses in importing, high technology and manufacturing. He now operates Entrepreneurial Business Consultants of Canada and also owns a book publishing business. He holds degrees from Oxford University and from St. Andrew’s, Scotland. Iain has prepared business plans for many clients and writes from firsthand experience which he shares with you. This book contains a wealth of knowledge accumulated over many years. 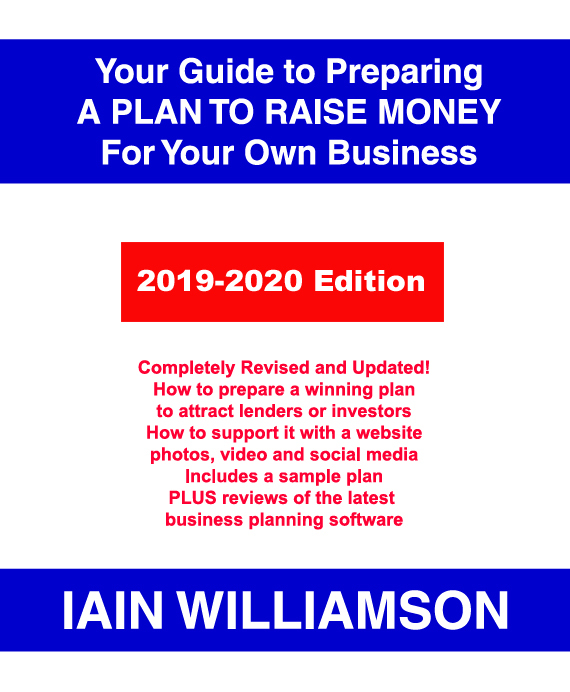 Your Guide to Preparing a Plan to Raise Money for Your Own Business: 2018-2019 Edition by Iain Williamson, 290 pages, softcover, ISBN 978-1-55270-797-5; ISSN 1191-0496; published in August 2018; Canadian $56.95. How Many Businesses Have a Plan? Are You Going to be Defensive or Offensive? CHAPTER 5 Your Choice: Debt or Equity? Can Your Business Raise Debt? Why is Your Deal Structure So Important? What is Your Basic Financial Aim? The Internet Brings it All Together from an Advertising Perspective! Yuppies, Guppies, Boomers and "Geners"
It's Time to Organize Your Priorities! Then, Shoot the Alligators Blocking Your Way to the Exit! Finally, if you Have the Time, Shoot the Alligators Basking in the Sun! Get on Top of Your Projects! What is the Investor or Lender Looking for in Your Plan? If You're Terrified of Speaking in Public, You're not Alone!